Also known as “floating” or “parking-adjacent” lanes, offset transit lanes place transit vehicles in the right-most moving lane, but are offset from the curb by street parking, curb extensions, or raised cycle tracks. On multi-lane streets with on-street parking, loading, parklets, and other curbside uses, especially streets with retail. Where existing bulb-outs or other geometric considerations preclude the use of curbside parking lanes for transit. Streets with in-lane stops in the form of bus bulbs, islands, and other significant stop amenities. 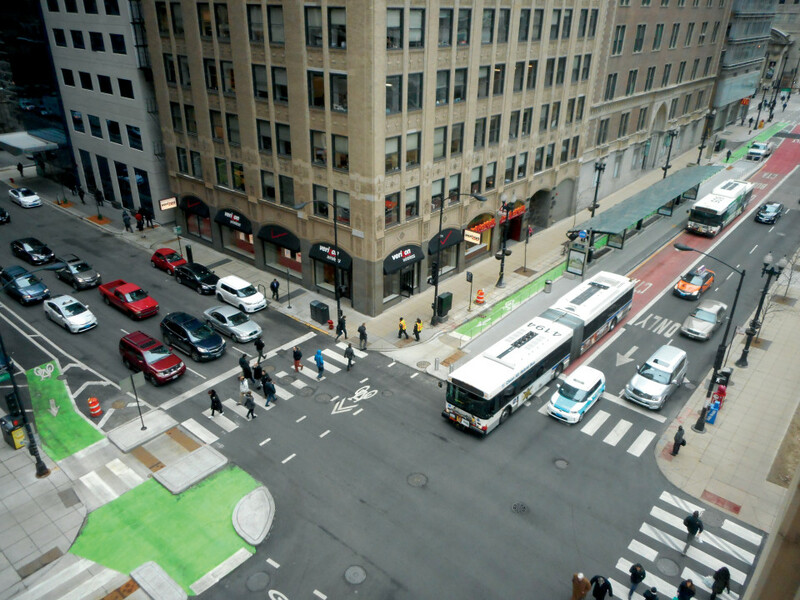 Offset transit lanes accommodate high transit vehicle volumes and improve both reliability and travel times on streets operating near or beyond their motor vehicle traffic capacity. Asha Weinstein Agrawal, et al. 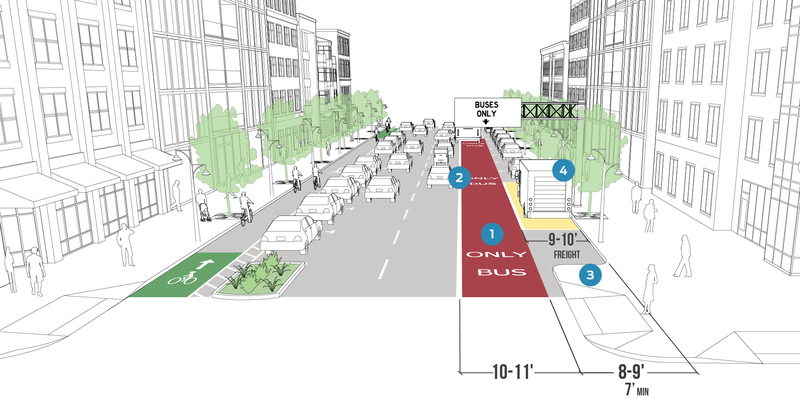 Shared-Use Bus Priority Lanes on City Streets: Case Studies in Design and Management. Report No. CA-MTI-12-2606, Mineta Transportation Institute (2012). Offset transit lanes reduce delays due to congestion. 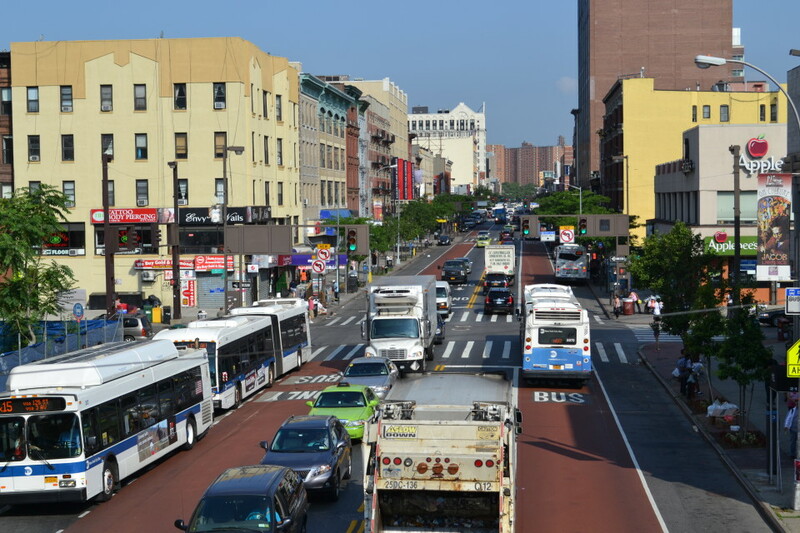 Offset transit lanes raise the visibility of high-quality services, especially rapid service. Offset transit lanes maintain space for other curbside uses, such as parking, loading, bulb-outs, or parklets. Implementation is relatively easy; reconstruction of curbs is less likely to be necessary than for curbside transit lanes. In commercial areas, lanes are prone to encroachment due to double-parking, deliveries, and taxicabs; enforcement is critical. Enforcement strategies vary based on state and local laws and statutes. Some cities classify bus lane violations as civil infractions (enforcable by civilian agents and/or by automated cameras), or have contractual agreements between police departments and DOTs to establish enforcement responsibilities. Turns can be accommodated in short facilities near the intersection, including right-turn pockets, shared transit/bike/right-turn lanes, or dropped transit lanes (see page <?>). Each of these facilities may reduce vehicle delay within the complete operation of the street, but can also degrade transit service, and must be applied carefully. Vertical separation elements between the bus and mixed-traffic lane are usually not feasible, since parking is preserved. Designate lanes using BUS ONLY markings and signs (MUTCD 3D-01 or similar markings). Dedicated transit lanes must be separated from other traffic using solid single stripes or double white stripes. A solid single white line conveys that crossing into the transit lane is discouraged, and typically indicates that using the transit lane to pass is prohibited, whereas a double solid white line means that encroachment is legally prohibited (MUTCD 3B.04). Enforcement is critical to maintaining the lane’s integrity. Vehicle-mounted photo/video enforcement has been demonstrated to be effective in improving transit lane compliance. By equipping its entire transit fleet with enforcement cameras, San Francisco’s Muni has seen delay reductions on routes with transit-only lanes ranging from 3 to 15% throughout the day. During afternoon peak, when delay is most significant, Muni has observed even better delay reductions, ranging from 7 to 20%. San Francisco Municipal Transportation Agency. Transit-Only Lane Enforcement. 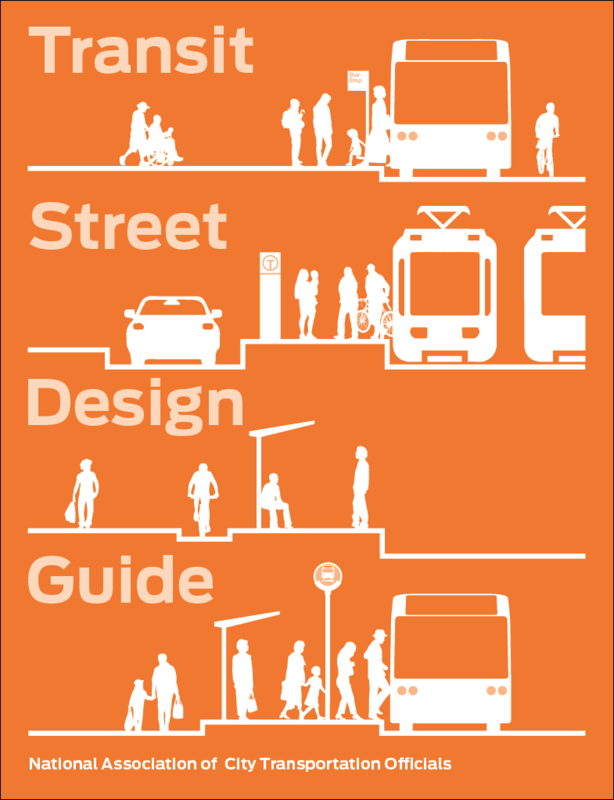 MuniForward white paper (2015). 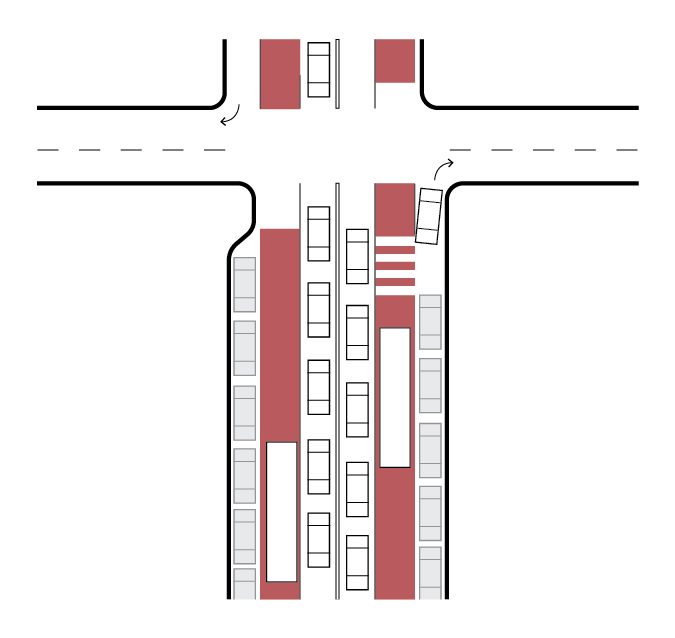 Bus lane width should be determined within the overall assemblage of a street, taking into consideration adjacent lane uses, with a desired width of 10–11 feet. At stops, bus lane may narrow to 9 feet. 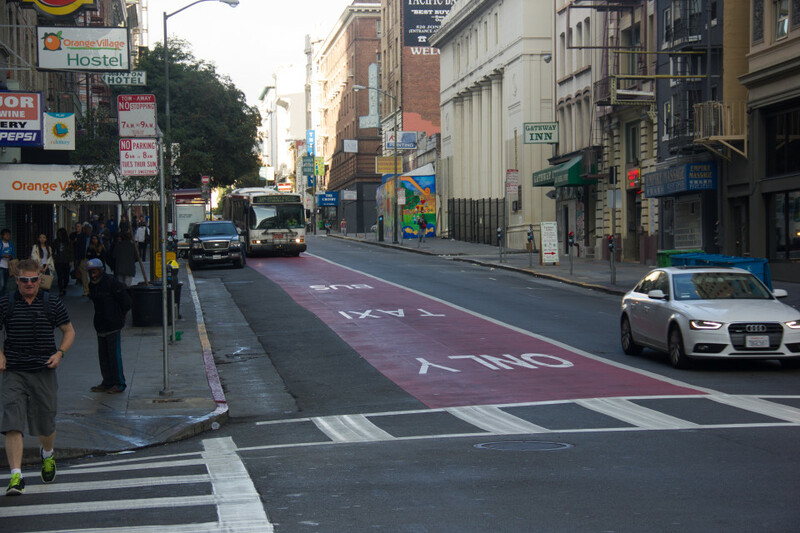 Red color treatments are effective in reinforcing lane designation. Apply red color along the entire lane. Transit bulbs should be installed at stops to enable in-lane stops, and provide space for other stop and sidewalk amenities. Curb extensions may be installed at non-stop intersections to increase pedestrian space and shorten crossing distance—interim treatments and materials such as paint, planters, and bollards can be implemented at low cost. It may be desirable to assign additional space to a buffer or to a parking lane rather than to the bus lane, especially when large vehicles use the parking lane for loading. A 10-foot bus lane provides a predictable operating environment when adjacent to a buffer or bicycle lane on at least one side. Bus lanes may be wider to calm traffic in other lanes and reduce risk of mirror damage and minor collisions. Since mixed-traffic lanes should not be wider than 11 feet in urban conditions, extra width may be assigned to the transit lane or to a marked buffer if 2 or more feet are available. If adjacent to a buffer or a bike lane, a 10- or 11-foot bus lane should be provided. Research suggests that lane widths less than 12 feet on urban and suburban arterials do not increase crash frequencies. Potts, Ingrid, Douglas Harwood, and Karen R. Richard. Relationship of Lane Width to Safety on Urban and Suburban Arterials. Paper presented at the TRB 86th Annual Meeting, Washington, DC: January 2007. Relationship Between Lane Width and Speed. Parsons Transportation Group, Washington, DC: 2003. 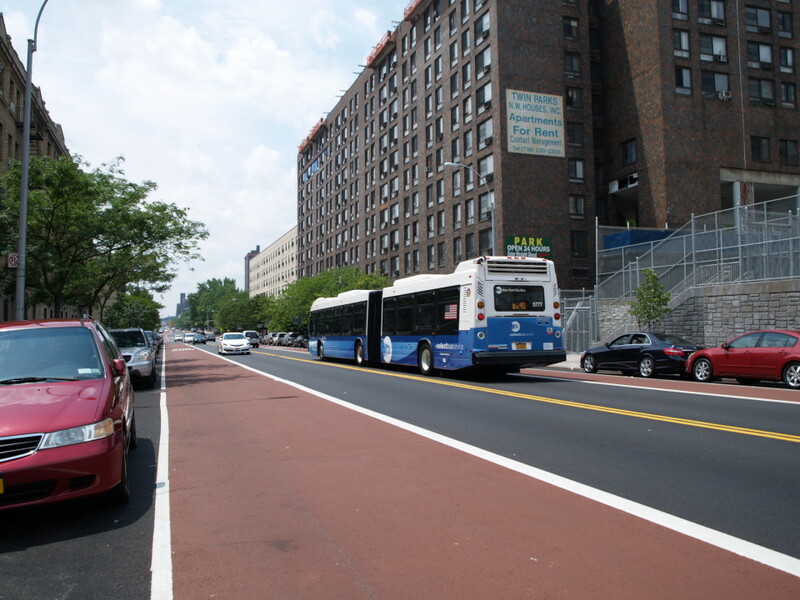 To keep bus lanes unobstructed, parking lanes adjacent to an offset bus lane should be 8–9 feet wide in most cases, or up to 10 feet when truck loading zones are designated or curbside deliveries are frequent. 7-foot parking lanes may be used next to 11-foot bus lanes if compliance is high and wider vehicles are not permitted to park. Provide shared right-turn lanes or right-turn pockets at intersections with moderate to heavy turn volumes. 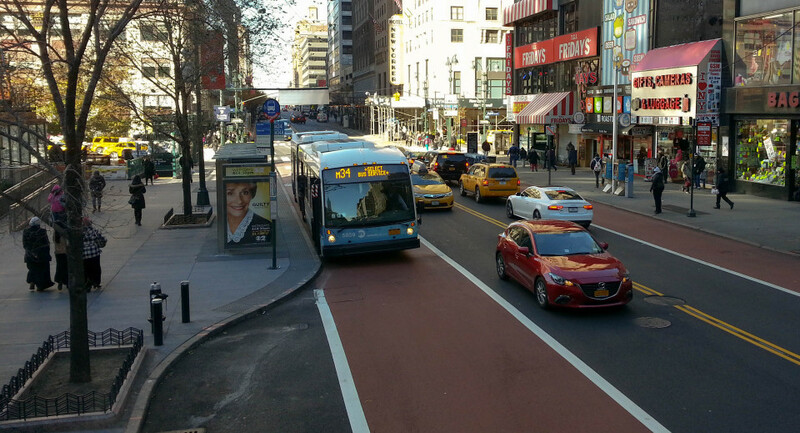 Offset transit lanes can allow other users, including taxis, for-hire vehicles, and bicycles. Use markings and signs to indicate permitted users. References for Offset Transit Lane: 1 found.